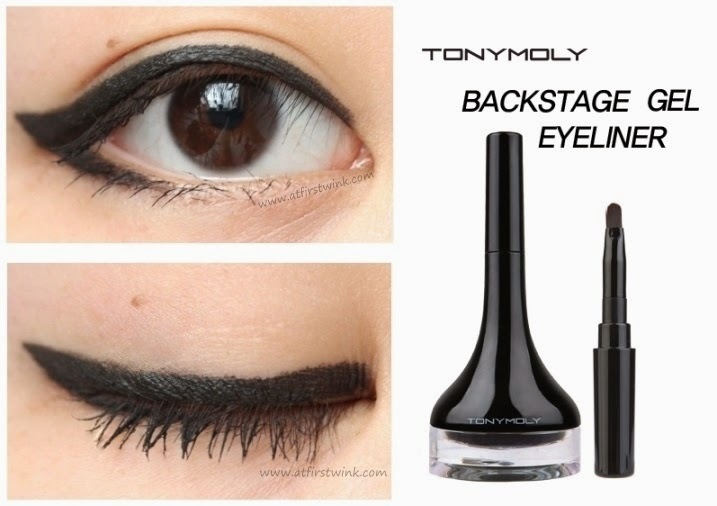 I have this Tony Moly Backstage gel eyeliner in black for a long time already, to be precise, ever since my third Gmarket order arrived about two years ago. I have only used it once or twice, because a gel liner is just not the right thing to get, when you have never drawn a neat line before. After reading the cat eyes tutorial from Misa, it made me want to take the Tony Moly gel eyeliner out again to practice. The Tony Moly gel eyeliner has a very interesting packaging: the brush can be clicked into the pen holder like lid of the gel eyeliner. After taking the brush out, you can extend the brush's length with another 1 cm (make sure to twist it for it to keep in place). The brush has really good hairs that do not disperse (no matter how hard you press) and are made of strong material that is very flexible. Thanks to that, you can very easily apply the gel eyeliner. The good brush and handy packaging (I cannot really lose the brush) are the main reasons, I bought this gel eyeliner from Tony Moly. All pictures in this post are mine, except for in the last picture, I used the Tony Moly brand logo and product picture. The pictures of the eye are mine.